NAPLES, Italy, June 3, 1972 -A United States Navy plane crashed in northern Morocco today, killing all 14 men aboard, a Navy spokesman at Sixth Fleet Headquarters in Naples said. The four-engine P-3 Orion submarine patrol craft crashed into the side of a 2,700-foot mountain about an hour after taking off from the Rota Navy Base in southern Spain, the spokesman said. A Navy helicopter with medical personnel flew from Rota to the crash scene and its crewmen radioed that there were no survivors. The spokesman said that the plane belonged to Squadron VP-44 and was on a routine patrol. He said the aircraft was stationed at Rota from its home base in Brunswick, Maine. The Navy this morning was still withholding names of the 14 VP-44 crewmen killed Saturday in northern Morocco when a P3 Orion submarine patrol airplane crashed into a 2,700 foot mountain south of Algeciras, Spain. Twelve of the 14 were based at Brunswick Naval Air Station, according to the Navy. The squadron has been on deployment at Rota, Spain, for about two months. Two members of the crew were based at Rota. Names of the crewmen were being withheld pending notification of kin, a Navy spokesman said. The names were expected to be released sometime today. One of the victims was Louis B. Comeau, 31, Lisbon. A Lewiston, Maine, native, Comeau's wife and family are residents of Lisbon. A memorial service for the lost crewmen is expected to be held sometime this week, according to an information officer at BNAS. He said details will be announced later. According to the Navy, the crash happened about one hour after the plane took off from Rota on a routine mission. Cause of the crash is unknown but investigation is expected. The plane was one of nine attached to VP-44. About 250 men from the Brunswick-based squadron are at Rota conducting submarine searching activities in the Mediterranean area. The Navy said the crash was first spotted by Spanish fishermen who watched the four-engine plane crash and explode in flames. A British ship, the HMS Zulu, sent a helicopter to the scene and reported at least five bodies sighted in the wreckage. A Navy helicopter with medical personnel aboard also reached the scene and reported no survivors. Rota, where the squadron is on a five-month deployment, is one of the largest facilities in the Mediterranean equipped for antisubmarine warfare activities. VP-44 came to Brunswick Naval Air Station in 1970 from Patuxent River Naval Air Station in Maryland. A memorial service is scheduled tomorrow at 2 p.m. at the Brunswick Naval Air Station Chapel for 14 crewmen, 12 of them members of VP-44, killed Saturday when their P3 Orion aircraft crashed on a 2,700 foot mountain on the northeast coast of Morocco. The crew included two area residents, Lieuenant CommanderRobert L. Mendenhall of White Street in Topsham, pilot of the plane and AE1 Louis B. Comeau of Lisbon. A BNAS spokesman also said that three wives of other crew members have residences in the area, but were away visiting family members at the time of the crash. The BNAS Chaplain will officiate at the 2 p.m. memorial service. Interested citizens are invited to attend, the spokesman said. Co-pilot of the submarine patrol plane was Lieuetnant (jg) Michael Whittig of Boise, Idaho. There was also a relief pilot aboard, Lieuenant (jg) Edmund B. Titcomb of Austin, Texas. Lieutenant Manson H. Cheek of Maysville, Georgia; ADJ1 Scott P. Russell of Sylvania, Ohio; AT3 James S. Janssen of Butler, New Jersey; AW2 Jarrell F. Crocker of Harpersville, Alabama; AN Robert E. Standley of West Palm Beach, Florida; AW3 Stephen K. Petersen of Staten Island, New York; AO3 Michael E. Ryan of Ft. Myers, Florida; AZ2 Thomas J. Kiley of Hazlet, New Jersey; AWCS Marvin T. Clay of Rome, Georgia; and AX2 Charles O. Wallace of Dansville, New York. All were killed when the plane crashed into the mountain while on what the Navy called a "routine mission" from Rota, Spain. The plane and crew were part of 250 men and nine planes of VP-44 on deployment at Rota since April. VP-44 has been stationed at BNAS since 1970 when the squadron was relocated from the Patuxent River Naval Air Station in Maryland. The crash victims included 12 regular VP-44 men and two stationed at Rota. NAPLES, Italy--Fourteen Navy men died June 3 when their four-engine P3 Orion patrol plane crashed into the side of a mountain across the Straits of Gibraltar from Algeciras, Spain, about an hour after taking off from the Rota Naval Base in southern Spain. 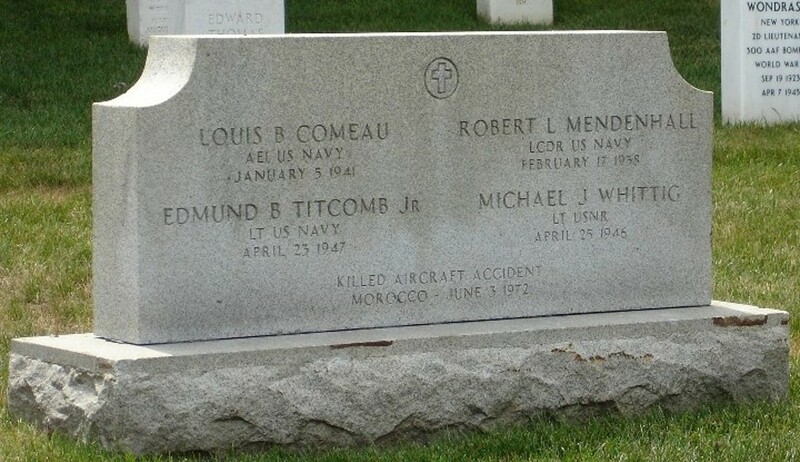 Killed were: Lieutenant Commander Robert L. Mendenhall, Lieutenant Manson H. Cheek, and Lieutenants (jg) Edmund B. Titcomb Jr. and Michael J. Whittig. Also, Senior Chief Aviation ASW Operator Marvin T. Clay, Aviation Machinist's Mate First Scott P. Russell, Aviation Electrician's Mate First Louis B. Comeau, Aviation ASW Operator Second Jarrel F. Crocker, Aviation Maintenance Administrativeman Second Thomas J. Kiley, Aviation ASW Technician Second Charles O. Wallace, Aviation Electronics Technician Third James S. Janssen, Aviation ASW Operator Third Stephen K. Peterson, Aviation Ordnancemen Third Michael E. Ryan, and Aviation ASW Operator Airman Robert E. Standley. All crewmen were assigned to Patrol Squadron 44, home-based at Brunswick, Maine, except Chief Clay and Petty Officer Wallace who were attached to the Antisubmarine Warfare Classification and Analysis Center at Rota.